On the 31st of October and the 1st of November, professionals from business leaders and C-suite executives, to key decision makers and elite IT experts will arrive to the London Excel for this year’s Microsoft Future Decoded. At last year’s Microsoft Future Decoded, more than 12,000 attendees discovered how digital transformation is changing everything we do – and how to take advantage of that change. This year, attendees will again take a deep-dive into Digital Transformation and AI to learn how businesses can grow while managing disruption in these exciting times. Version 1 is a sponsor of this year’s Microsoft Future Decoded and will be available at Stand #36 throughout the event. Visit us at Stand #36 to speak to us, or arrange to speak to us through the form at the end of this page. We will be keen to hear from other attendees in our network. Keep up to date with us throughout Microsoft Future Decoded @Version1Tweets. 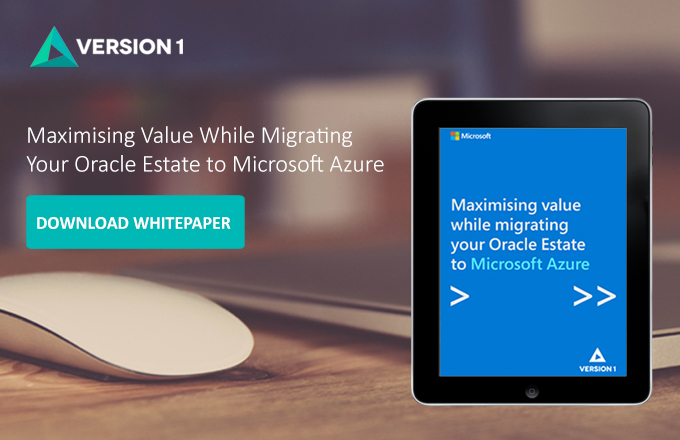 Version 1 will be speaking to attendees at this year’s Microsoft Future Decoded about ‘Maximising Value While Migrating Your Oracle Estate to Microsoft Azure’ the focus and title of our whitepaper recently published in collaboration with Microsoft. If you would like to receive a copy of the whitepaper ahead of the event, please click here to download the whitepaper. The first keynote of MFD on the morning of the 31st of October will feature industry leaders and top speakers in digital transformation, who will reveal the shape of things to come. Microsoft UK Chief Executive Officer Cindy Rose will lead the talk, accompanied by Jason Zander, Executive Vice President – Azure Team. Cindy and Jason will be joined by Chris Bishop, Technical Fellow and Laboratory Director at Microsoft Research Cambridge, and Michael Wignall, Chief Technology Officer of Microsoft UK. The highly anticipated afternoon keynote on the 31st of October will feature Sir Michael Caine CBE, Scientist and Broadcaster Dr Maggie Aderin-Pocock MBE and Clare Barclay, Microsoft UK Chief Operating Officer. During the Thursday morning keynote, attendees will hear from Rt Hon Ester McVey MP, the Secretary of State for Work and Pensions, Satya Nadella, Microsoft Chief Executive Officer and Jenny Lay-Flurrie, Microsoft Chief Accessibility Officer.